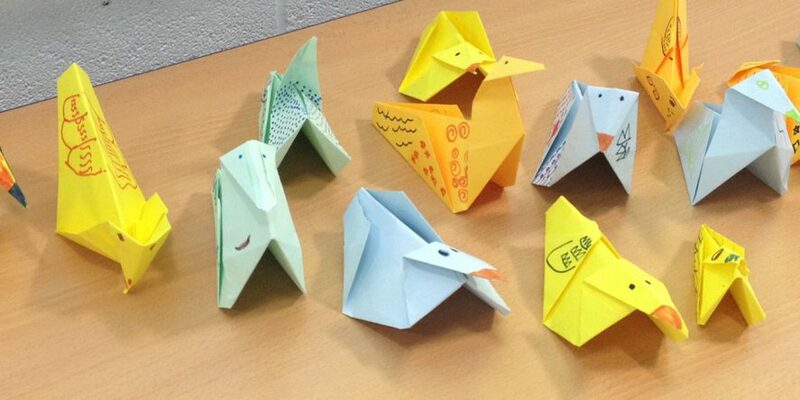 I am really pleased to have been invited to another school project tomorrow with Skills Service Peterborough; it’s called the Duck Production Challenge and is basically a chance for school pupils to get an insight of the business world by making and selling ducks. As a buyer I will be quality checking the ducks that the children have made from origami, then offering the seller a price (my stash of Monopoly money) for the duck, less money for damaged ducks and more money for a creative duck. Plus, as the event is taking place on Valentine’s Day I shall be looking at duck couples too. I will be attending with other business owners and people in business, who will also be buyers of the ducks for different teams – it is then a case of which ‘company’ wins, by selling the most ducks or making the most profit. Previously I have helped at projects with the Skills Service and even this school and although I have been part of this style of event, I have not yet been a buyer of ducks so I am really excited about what I can expect but also to meet the children and learn a little about them too. I really enjoy helping at projects like this at school, especially those that help children understand what the ‘real business world’ is like. The real life contact for children with people in business can be a rare opportunity so that is another reason why I am excited to be part of this project. It is the Year 8s at Ken Stimpson school that I will be working with, so children aged 12 and 13 years old, so they are still at that nice stage – before their hormones go crazy… so that will be nice too! If you are keen to help out at a school project like this I still need volunteers for the careers awareness day in Deeping, or if you drop me an email I can connect you with the Skills Service?